Location: Located over the Afon Lliedi at the head of Carmarthenshire Dock. Carmarthenshire Dock was built c1799 by the local industrialist Alexander Raby as a shipping point for his coal and iron. A tramroad was built from the canal to Raby's furnace at Cwmddyche at the same time. In 1802 the Act was passed for the 'Carmarthenshire Railway or Tramroad' to be built from the dock to limestone quarries west of Llandybie. The tramroad was opened in 1803, making it by a few weeks the earliest autonomous public railway in Britain. The engineer was James Barnes, who was also responsible for the company's reconstruction of Carmarthenshire Dock in 1804-6, which included constructing a new quay on the west bank of the river, a connecting wall to the east quay, and later a weir and reservoir. The dock remained busy throughout the nineteenth century. The dock continues to be used to moor small boats. A well constructed single-arched stone bridge, believed to date from 1805. Long abutments are straight on its northern side but curved outwards slightly at its south-eastern wing. They are battered on the upstream side. There is a shallow segmental arch, now of red brick. The bridge itself is of carefully dressed sandstone. On the north elevation, the arch is inset to seat weir planks to dam the river, probably to assist scouring of the dock. Large copings are level with the bridge deck, which is typical of early nineteenth-century tramroad bridges in being flat and without parapets. Unusual iron stansions bolted to the copings support modern railings. 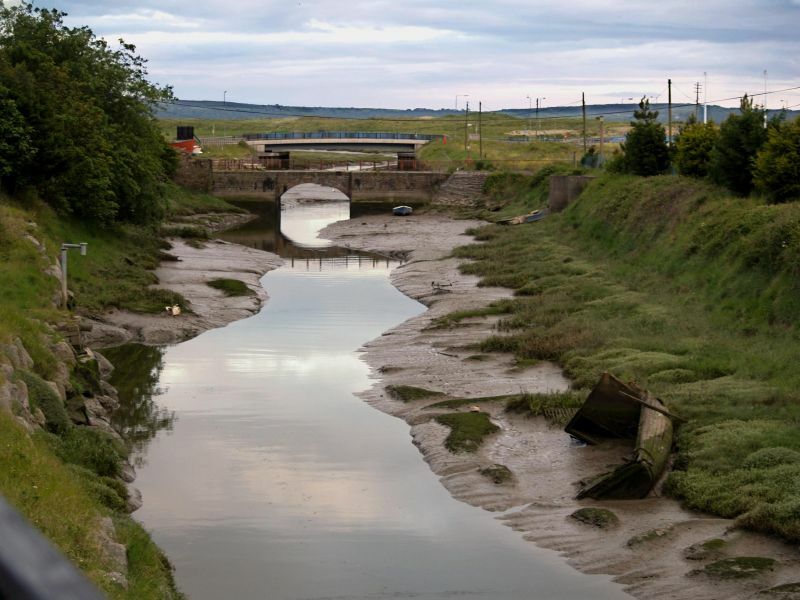 Listed as an important structure from Llanelli's early industrial development, and a rare surviving bridge from the first public railway opened in Britain. Located on the west bank of the Afon Lliedi adjacent to North Dock. Located on the east bank of the Afon Lliedi adjacent to North Dock. Set back from dock edge at north east angle of Dock area, by west bank of Afon Lliedi. Situated overlooking former back lane, now with cleared ground to Marine Street, some 70m north west of Siloah Chapel, Glanmor Road. Situated on corner of Glanmor Road and Copperworks Road in the seaside district of LLanelli. Situated opposite south end of Siloh Street.